Acoustic guitars come in two distinct flavors which are often mixed, even though they are very different. Classical guitars are a completely different type of animal compared to standard steel string acoustic guitars. They have a different dynamic, different tone, and generally require a different playing technique. If you are looking or a good classical guitar, you are in the right place. Today we are going to show you some of the best classical guitars under 1000 dollars. Let's start with some important info. **There is more information below, but feel free to check out the Amazon reviews for a second opinion! Every instrument has its own quirks. This also applies to classical guitars. Sure, there are some traits that are shared with steel string acoustics, but classical gu﻿itars adhere to very different standards. Before you go out and make a decision, here are some pretty important factors you might want to consider. If there is one thing that people often disregard when choosing a classical guitar, it is the shape. Unlike it is the case with electric guitars, which are slim and pretty easy for most people to handle, acoustic guitars might cause some trouble. Comfort is one of the most important requirements that need to be met. If you can't comfortable access the neck or the bridge of the guitar, no amount of technique or talent will help you. In other words, make sure that the guitar you end up choosing fits you well. A well built guitar is only as good as the sum of its components. That means that hardware also needs to be on point. This is where tuners come into play. A good set of tuning machines can make or break the performance of any guitar, let alone a classical one. What you want is consistency, no matter if it comes from an average or top tier set of tuning machines. As long as the guitar is capable of maintaining the key you want, you won't have issues. The problem is that many cheaper classical guitars come with sub par tuning machines, making you retune it more often than it is usual. Tonewood is what ultimately defines the quality of any guitar's tone. This is even more emphasized with classical guitars. A classical acoustic guitar is more mellow by its own nature, meaning that the tonewood needs to be able to produce warmer and more rounded tones. Some of the most popular choices of tonewood for the top are spruce and cedar, with cedar being a bit more adequate for this type of guitar. What is more important than the type of tonewood is the nature of the wood used. What we mean by this is whether you are dealing with a solid top or a laminate one. Given the price range we are working with here, solid top is the only acceptable answer. Kremona's Verea is one of the most well rounded classical guitars on the market at the moment. The build quality is superb and the tonewood used makes it a great performer. They went with a solid spruce top in a body that features a cutaway. On top of a great acoustic performance, this Kremona model comes with a set of dual source Fishman Presys electronics. You are looking at a great acoustic electric model that has managed to preserve the mellow tone only quality nylon string guitar can produce. If you want outstanding craftsmanship and even better performance, this is the guitar to get. Cordoba is another very famous name in the classical guitar industry. This company has made it their mission to bring back this type of guitar to its former glory. 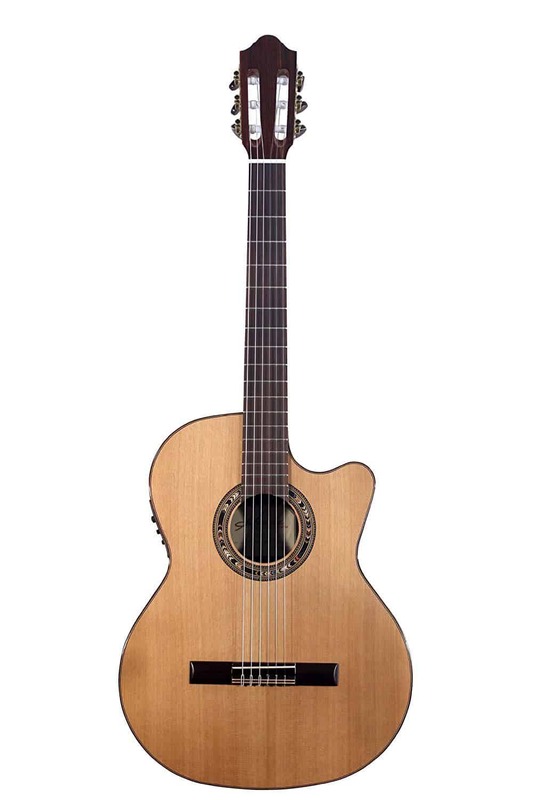 Cordoba C9 is one of the go-to models for many classical guitarists out there. Featuring a solid cedar top paired with mahogany back and sides, you can already imagine just how good this guitar sounds. This is a more traditional design that is centered around providing the user with the best possible tone and definition. Needless to say, it performs this function rather well. Cordoba is definitely one brand you can trust when it comes to classical guitars. Finding a hand made acoustic guitar in what is still considered to be somewhat affordable price range was almost unthinkable not so long ago. That's when La Patrie stepped in with their Canadian magic. Their Collection is by far one of the most popular classical guitars of today. Hand crafted in Canada, Collection features their pressure tested solid cedar top and a build quality that is hard to match for this kind of money. The tone you get is just impressive all around. While La Patrie doesn't enjoy the same kind of reputation as Cordoba, they offer proven quality. Here's another model from Cordoba, only this time it is their Fusion 14. What makes this classical guitar particularly interesting is the fact that it comes with a solid Indian rosewood top as well as back and sides. Rosewood is one of the hardest tonewoods out there, which makes this guitar even more odd. However, the resulting tone is just incredible. On top of that, it's an acoustic electric model that comes with that same Fishman Presys set of electronics. If you are looking for something a bit different, Fusion 14 is a model you have to check out. Last but not least, we have the Yamaha CG171SF. This is a traditional flamenco style classical guitar that features a solid spruce top combined with cypress back and sides. The neck is a standard Nato piece that is pretty comfortable to play. One thing about Yamaha's acoustic guitars is just how well made they are. This is true even though this is a serial production model. When it comes to its sound, it is fair to say that it punches above its weight class. If you need a more 'affordable' solution, Yamaha CG171SF is one of the safest choices you have. Choosing the best classical guitar under 1000 dollars is definitely not easy. There are just so many models that offer a great performance as well as overall quality. We have chosen our picks based on their proven tone and solid construction. 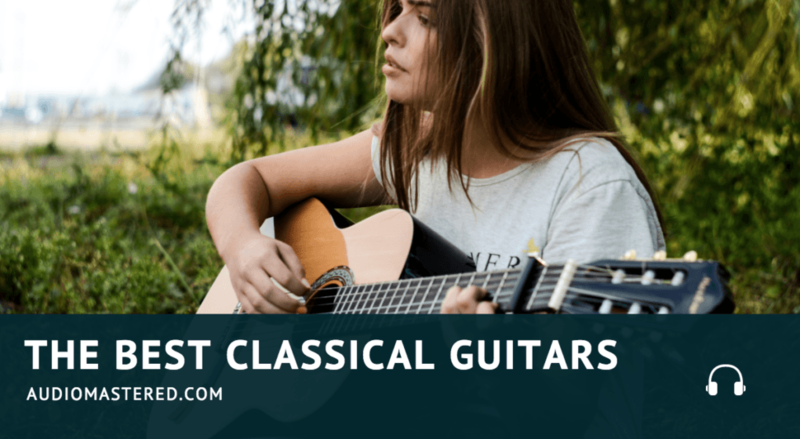 Some of these are more budget friendly, but they are all quality classical guitars.